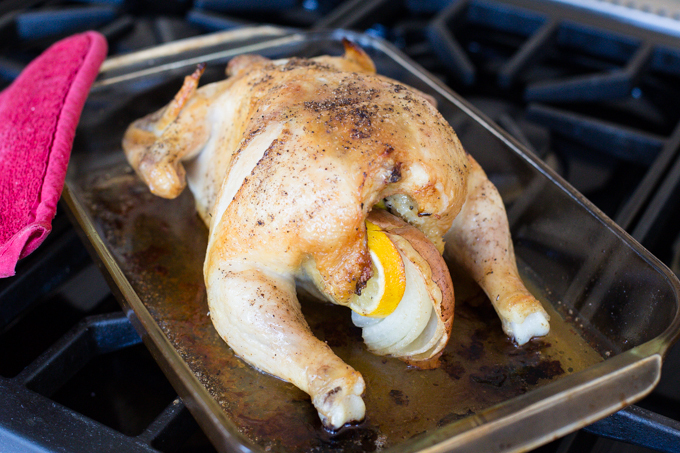 Roast Chicken is so easy and it’s so versatile when it comes to recipes. The first obvious choice is to enjoy it for dinner. If I had done that, I probably would have served it with a side of mashed potatoes and some roasted veggies. But, I didn’t do that. In fact, we might have had take out that night. Instead, I roasted up a lot of chicken and cubed/shredded it up. Some is in the fridge and will be used this week and some is in the freezer. I’ll probably use that for enchiladas. I roasted both a couple of double boneless breasts and also a whole chicken (don’t judge, I know the whole chicken is upside down). I did them pretty much the same way, loaded with lemon, onion, fresh thyme, fresh rosemary, salt, and pepper. 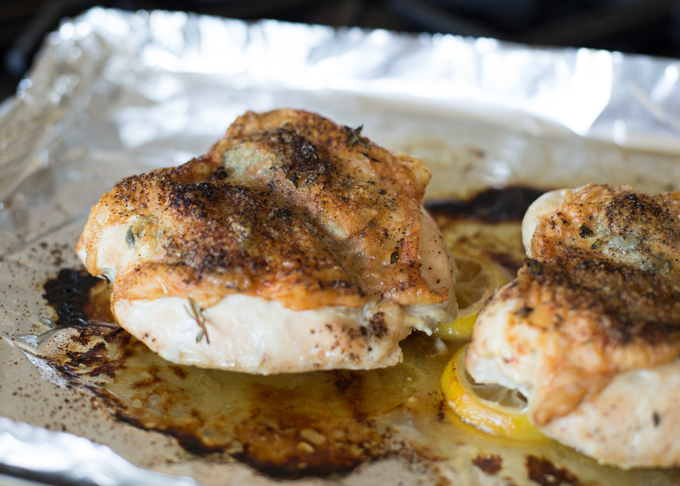 For the breasts, I cut a few lemons and put them in the pan first (drizzled with olive oil), then placed the chicken on top. The pulled back the skin on the chicken breasts and shoved some herbs under the skin. I drizzled olive oil on top and added salt and pepper. They roasted at 350* for approx 45 minutes. 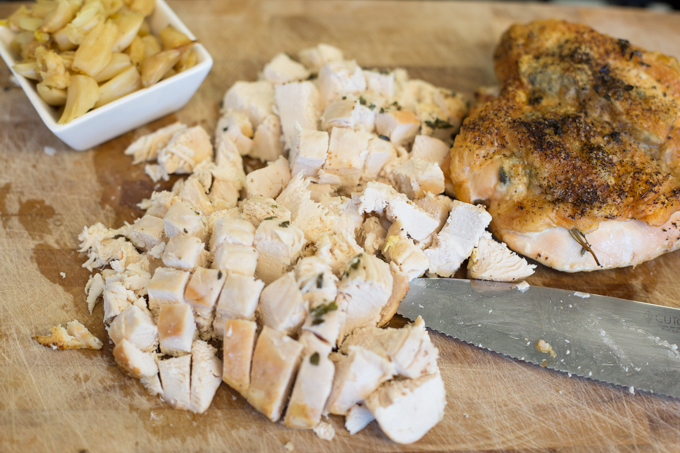 Time will depend on size of chicken breasts. For the whole chicken, I filled the cavity with a whole head of fresh garlic (not peeled), lots of sliced lemon, a half of red onion (quartered), and a few sprigs of thyme & rosemary. Drizzle the top with olive oil and sprinkle on some salt & pepper. My chicken was only about 3 1/2 lbs. I roasted it at 350* for about 45 minutes, then increased the oven to 450* for another 15 minutes. Again cooking time will vary depending on size of chicken. Juices should run clear when cut into. 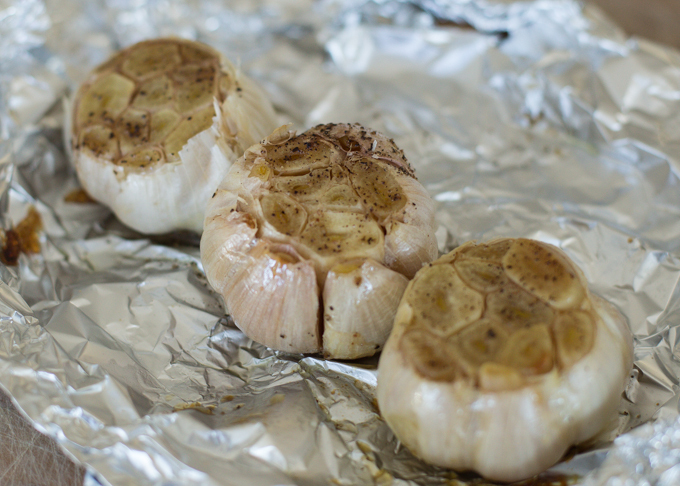 And since I was in a roasting mood, I also roasted up some whole garlic. To roast, I cut the top of the head off (don’t peel the garlic), drizzle on a little olive oil, and salt & pepper. Wrap in foil and roast. 350* for 45 minutes. When finished, cool slightly, then just squeeze the gooey garlic goodness out of the skin. Use or freeze for later. 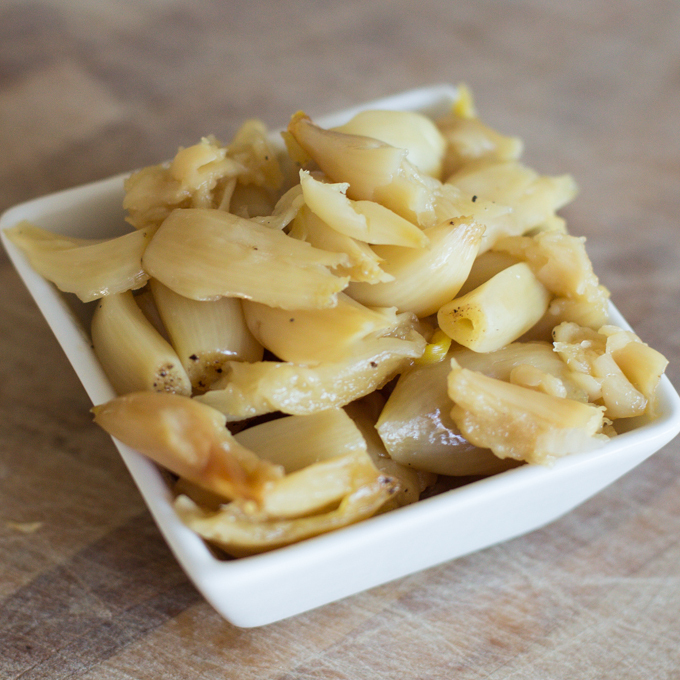 Roasted garlic is nothing like raw garlic. It is soft, creamy, sweet, and only slightly garlicky! It’s great served on crackers with a little brie. I ended up by adding some to a Cauliflower/Potato Mash that I did and then froze the rest. Thank you! It’s so great to have some in the freezer for a quick soup, stew, or pasta add in. I’m going to use mine for some enchiladas. Looks delicious! Is it possible to provide a recipe that is easy to print at the bottom of your post? I’d love to print out the recipe and add it to my cookbook. Hi Maren, I do include printable recipes on most of my posts, however, occasionally, when it is a simple recipe where the recipe can have so many variations, I find it more helpful to my readers to give ideas and suggestions on “how to” instead of exact measurements.